Discover a combination of small town living and big city amenities at the Best Western Lorson Inn - the ideal hotel in Flora, Illinois. The Best Western Lorson Inn is conveniently located near key attractions and business locations in the Clay County region of Illinois. Hotel guests will be close to Hella Electronics, Clay County Hospital and North American Lighting. Guests can also enjoy a beautiful nine hole golf course located nearby and adjacent to Charley Brown Park, a perfect place for a picnic and a ride on the "Little Toot" miniature railroad. The hotel location also offers proximity to quaint gift shops and excellent places to dine in downtown Flora. Each well-appointed room features free high-speed Internet access, microwaves, refrigerators, and cable television with premium movie channels. 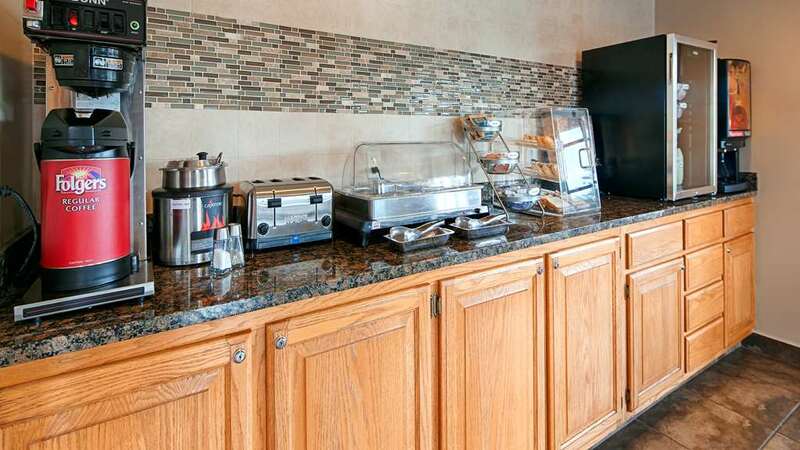 Other hotel amenities include an exercise room and a delicious breakfast bar. The Best Western Lorson Inn does offer pet friendly rooms. Please call direct for stipulations and available room types. A friendly and professional staff will ensure every guest has a comfortable and memorable stay. Make an online reservation today and save at this hotel in Flora, Illinois! Julians: 1.5 mile(s) from Julians, American family style at low prices and delivery after 4:00 p.m. open daily from 9:00 a.m. to 9:00 p.m. Subway: .3 mile(s) from Subway, sandwiches and salads, 9:00 a.m. to 9:00 p.m.
Pizza Hut: Adjacent to Pizza Hut, pizza and pasta at moderate prices, delivery and take out service, 11:00 a.m. to 10:00 p.m.
Burger King: .2 mile(s) from Burger King, Fast Food, American, 6:00 a.m. to 11:00 p.m.
McDonalds: .4 mile(s) from McDonalds, Fast Food, American, 6:00 a.m. to 11:00 p.m.
Five Brothers: 1 mile(s) from Five Brothers, family style at moderate prices, 6:00 a.m. to 9:00 p.m.
From: The north. Go south on Highway US 45 to Highway US 50, east on Highways US 45/50 to Country Road 1100 E, then north and immediately east on Gary Hagen Drive to the Best Western Lorson Inn. From: The south. Go north on Highway US 45 to Highway US 50, west on Highways US 45/50 to Country Road 1100 E, then north and immediately east on Gary Hagen Drive to the Best Western Lorson Inn. From: The east. Go west on Highway US 50 to Country Road 1100 E, then north and immediately east on Gary Hagen Drive to the Best Western Lorson Inn. From: The west. Go east on Highway US 50, to Country Road 1100 E, then north and immediately east on Gary Hagen Drive to the Best Western Lorson Inn.